The string area at the University of Evansville offers majors and non-majors alike numerous opportunities in the unique atmosphere of a professional school and small, closely-knit liberal arts institution. Artist faculty dedicated to providing the highest quality of instruction teach studio lessons on violin, viola, cello, bass, guitar and harp. 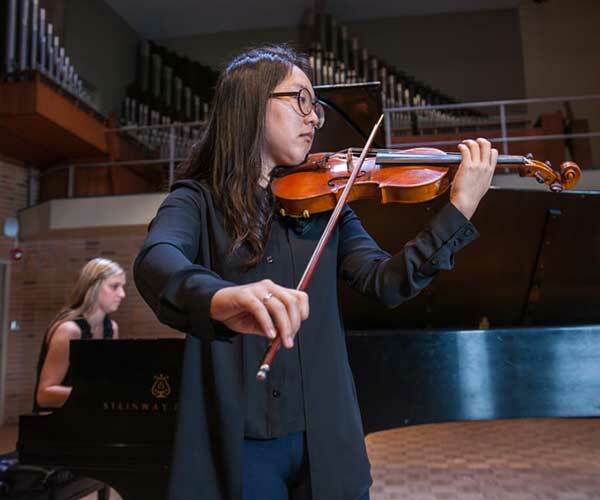 Weekly string area meetings and performances along with departmental recitals, a concerto competition and solo recitals provide ample opportunity for students, no matter what their degree choice, to challenge their skills as performers. 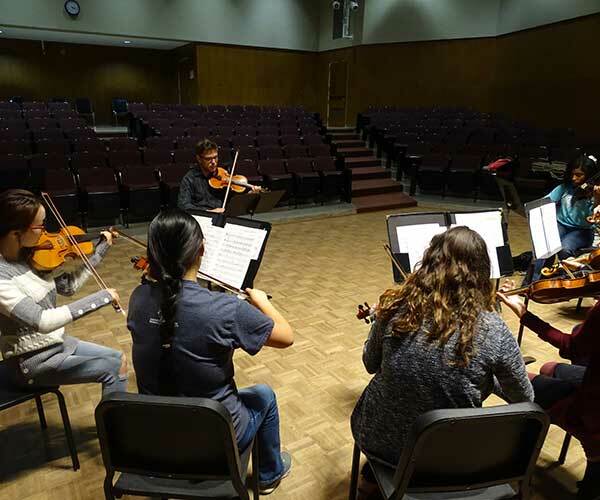 The University Orchestra, String Ensemble and chamber ensembles offer both string majors and non-majors from the campus community the opportunity to perform music of the world's foremost composers. String students regularly perform in campus master classes given by nationally known artists. Guest artists have included Michael Kannen; cellist and founding member of the Brentano String Quartet; violist, James Dunham, Professor of Viola and Chamber Music at Rice University’s Shepherd School of Music and former member of the Cleveland Quartet; bassist Edgar Meyer; and Mark O’Connor, fiddle soloist and composer. In addition, students have the opportunity to hear world class performers as soloists with the Evansville Philharmonic Orchestra. Something that sets our string department apart from other schools is the Evansville Philharmonic String Fellowship. This arrangement allows exceptional string students the opportunity to perform as contract players with the Evansville Philharmonic Orchestra. Equally unusual at the undergraduate level is the option to include training for the Suzuki Pedagogy Certificate as part of any degree. Classical guitar has long been a significant part of our string area. In addition to studio lessons, students have the opportunity to participate in guitar and jazz ensembles, and interact with world-class artists. The Department is pleased to have the Eykamp String Quartet on UE’s campus as artists-in-residence. Members of the quartet interact with students as coaches for small ensembles, clinicians in sectionals, and mentors for aspiring string musicians. Members also hold positions as principal string players with the Evansville Philharmonic Orchestra. The Eykamp String Quartet is made possible by the generous support of Rita, Richard, and Dorothy Eykamp, friends of the University of Evansville and Evansville Philharmonic Orchestra. Our graduates have gone on to earn advanced degrees at prestigious institutions, to perform with professional symphonies, and establish successful careers as private studio teachers and public school educators.